What on earth convinced me to purchase a $100.00 Mason Pearson hair brush? It never fails, whenever I enter a retail store, I'll swing by the hair product section. I used to do this for the purpose of finding quality products, but that ceased years ago. Nowadays, I venture over the hair aisle and gaze longingly at the combs and brushes. It's like I'm always seeking something better. I'm on a constant search for a brush and comb capable of taking my styling routine to the next level. Even though I always find the same selection of combs and brushes from store to store, something deep down inside me always seemed to whisper "there's gotta be something better." Now, mind you, I did find some pretty amazing detangling combs in the past. But that wasn't enough to satisfy my insatiable urges. My search continued. Then one day, it happened....I stumbled upon The Mason Pearson line of hair combs and brushes while wandering online. 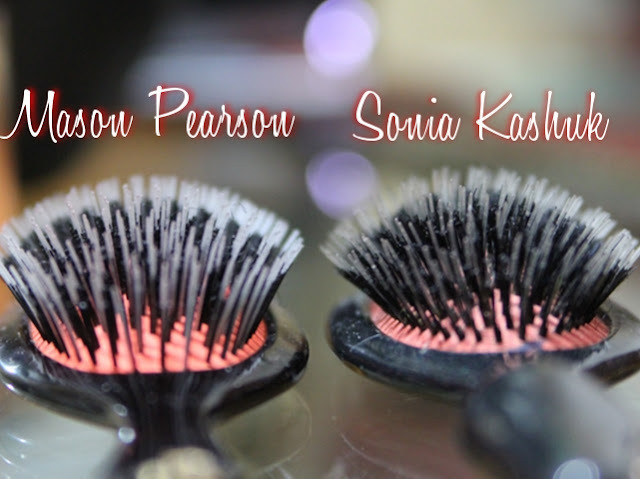 The Mason Pearson brush looked awfully close to my Sonia Kashuk brush I picked up long ago while at Target. Biggest difference was the price tag. I think I paid around $15.00 for the Sonia brush, meanwhile the Mason Pearson would run around 7X the price. The old Nadege would have flinched at the cost of this brush. You see, years ago, I was a certified cheapskate. I wanted to pay the lowest price for anything and everything I purchased. Meanwhile I didn't even notice how that way of thinking lead me to collect a series of sub-par quality products that I would have to replace and repurchase several times over. Then I began to shift from a scarcity mentality to one of infinite abundance. This change in mindset was not an easy one. But, looking back, I wouldn't have it any other way. What I realized was that if I invested a little more opted for the best I could afford, I would get so much in return. Soon, I became addicted to the quality which quickly over shadowed the cost. When I realized that the brush of my dreams was over $100.00, the first question I asked myself was "what makes this brush different?" -The brushes are known for their craftsmanship. I've read several accounts of people who've had their Mason Pearson brushes for 10, 20, and even 30 years (I'm crossing my fingers that this is the last brush of its kind that I purchase). -The bristles and nilon are said to be of superior quality. My Sonia Kashuk looks almost exactly like my Mason Pearson with one exception. My SK brush is showing obvious signs of wear and tear. To be fair, I've had the Sonia K brush longer and have used it more frequently. But I wonder if years from now, my Mason Pearson brush will maintain it's appearance better than its $15.00 counterpart. 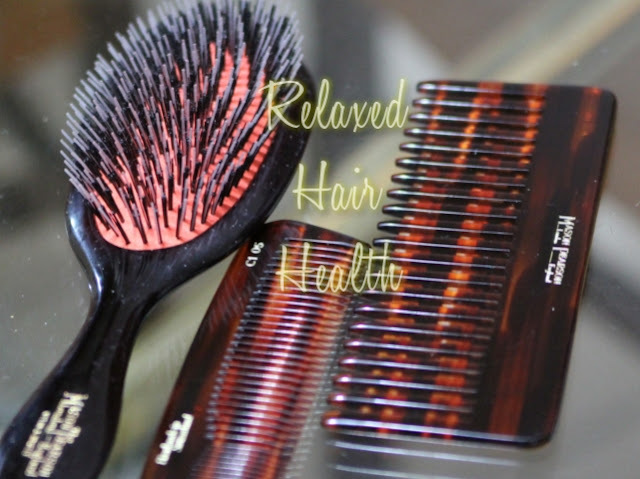 -The nylon bristles are said to stimulate the scalp for healthier growth meanwhile the brush helps distribute natural oils throughout the hair giving it a nicer appearance. What worries me the most with brushes is when they cause excessive harm to our hair. Looking at my Sonia brush now, I wouldn't dare use it for fear of mechanical damage which may occur due to the condition it's in. Mechanical damage is the type damage caused to the hair strand by an outside source. I talked a little more on this topic in this post. Combs and brushes are probably the biggest contributor of mechanical damage. My strategy is to minimize that type of damage is by opting for the highest quality brushes and combs I can get my greedy little hands on. Oh, and did I also mention that I picked up a couple of combs from their line as well? At around $30.00 each, one has to ask themselves "is this girl crazy?" Perhaps I am. But perhaps I considered that if this comb can indeed protect my hair from excessive mechanical damage (even if the improvement is slight), then it's worth the cost. I'm thinking that if this comb can allow me to retain more hair while styling, detangling, etc. Perhaps that's less money I will have to invest in quality conditioners and such. Who knows. I must admit that I have a pretty decent collection of quality wide tooth and detangling combs. But since these bad boys came into my life, things are different. At first I thought I made a mistake investing $30.00 on a comb. Especially since the teeth on it more narrow than my traditional (and favorite) wide tooth that I always use. It wasn't until I actually used this comb that I noticed an obvious difference between the Mason Pearson and my other combs that made me retire all of my combs for good. You see, the Mason Pearson is quieter than my other combs. "What the heck does that mean?" you ask yourself. Well I'm glad you asked. I never noticed this before I used my Mason Pearson comb but my plastic bone combs make a louder sound as I work it through my hair. Obviously the sound I'm speaking of isn't extremely loud but it's still present. The sound of friction as I comb my hair, is more evident when I use my large plastic wide tooth comb. I correlate this to the possibility of more mechanical damage. Based on the assumption that the more audible the sound, the greater the likelihood of excessive friction. Just a thought....not a proven fact. Since bringing these new additions to my all-star hair team, I must say that I'm pretty content. My cravings for ultra-effective combs have been quenched (for now). And I rest comfortably knowing that my hair is better protected during moments of styling. I'm not gonna go crazy and over manipulate just because I have a fancy, schmancy, hair brush. They are here to support my hair goals, not destroy them so I plan to use them and their amazing powers for good, not evil. Years from now, as I look back on my decision to elevate my hair comb game, I know I will smile longingly at myself and softly whisper "you did good, girl....you did good." I have the Mason Pearson Rake Comb and I love it!! Next on the list for me is one of their boar bristle brushes. Good choice Nadge. You won't regret it!! Yes! I'm glad someone out there agrees with me on the quality of their product! I know it's pricey but I think they're worth it. Thanks for sharing. I can't knock you for spending that kind of money. I bought a Hercules Sagemann comb for $17.50 (the most I've ever spent on a hair tool) and I definitely notice a difference. I'll be closely following your future opinions of these styling tools. Thank you for posting!